Longview as a General Contractor (Design-Bid-Build Method) typically involves competitively bid, lump sum construction contracts that are based on complete and extensive contract documents prepared by architects and engineers. These documents generally include construction drawings, specifications, and supporting information. The phases of work are usually conducted in linear sequence. The owner contracts with an architect for design; uses the design documents produced by the architect to secure competitive bids from contractors; and, based on an accepted bid, contracts with a contractor for construction of the building. In most situations during the design-bid-build method, Longview will begin preparation by receiving drawings and/or by receiving a notice to bid. It is a linear process where one task follows completion of another with no overlap. Plans and specifications are completed, and then forwarded to the general contractor for bidding. The downside to this method is that the project completion will usually take longer and sometime cost more. 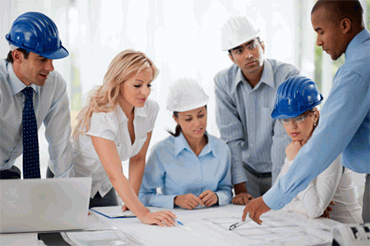 Multiple contractors bid the project exactly how it is designed based on the plans and specifications given. The lowest and most experienced bidder is awarded the project. This is the most familiar delivery method to most owners. This method is greatly used on projects that are not budget sensitive. This method takes a bit longer than the others and may require a re-design or a re-bid to meet the clients budget.